Another busy week for me, which meant another slow week on the blog. I did find a few things in my mailbox. A couple of new print books and an audiobook. How We Got to Now by Steven Johnson from Riverhead. The Lost by Sarah Beth Durst from Harlequin MIRA. Lauren finds herself trapped in a town called Lost on the edge of a desert, filled with things abandoned, broken and thrown away. And when she tries to escape, impassable dust storms and something unexplainable lead her back to Lost again and again. Big Little Lies by Liane Moriarty from Penguin Audio. Everyone’s loving Big Little Lies. I have it in print and need to get to it. The Big Little Lies audio is excellent! I couldn’t put it down. How We Got to Know sounds fascinating. Oh, I hope you LOVE Big Little Lies as much as I did! Your other books look good, too. Enjoy…and thanks for sharing. Big Little Lies on audio should be good. 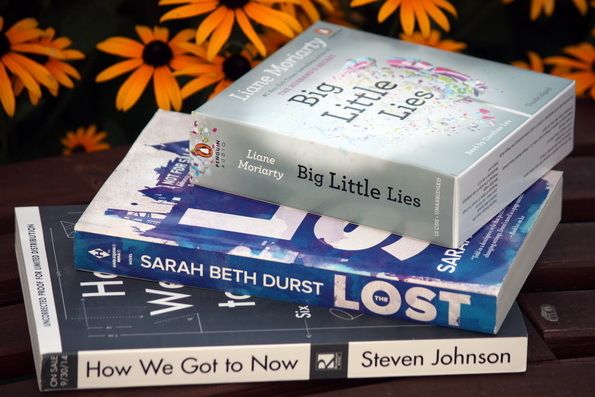 Those all look great butBig Little Lies is on my wish list! I have the audio of Big Little Lies and can’t wait to read it! How We Got to Now sounds really good! I should have said listen to it, not read it! Big Little Lies is on my audible wish list. I’ll watch for your review. Have a great week, Leslie. Looks like a good selection, esp. that Audio!